Officer Roy Rucker receives the State Office of the Year Award. 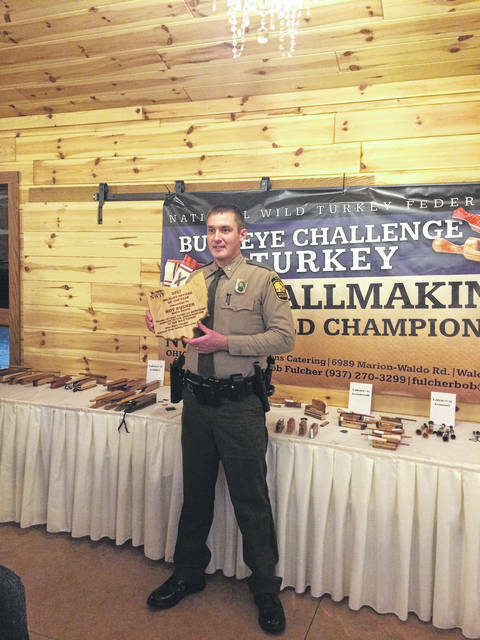 ATHENS — The Ohio Chapter of the National Wild Turkey Federation (NWTF) recently honored Wildlife Officer Roy Rucker with the State Officer of the Year Award. Officer Rucker has been serving Ohioans as a wildlife officer since 2005 and is currently assigned to Gallia County, according to the Ohio Department of Natural Resources (ODNR). Officer Rucker is dedicated to protecting Ohio’s fish and wildlife, demonstrated by his participation in numerous enforcement projects this year. He was nominated by the Gallia County Longbeards NWTF Chapter for his commitment to wildlife conservation in Gallia County. The club noted that within the last year Officer Rucker was successful in the investigation and conviction of a local wildlife violator, and he displayed his professionalism and communication abilities in working with out of state officers from Iowa. That case resulted in the confiscation of two deer heads which led to charges being filed in both Ohio and Iowa. Officer Rucker has taken part in the chapter’s JAKES turkey hunt, annual Wheelin’ Sportsmen event, and other activities at the club and throughout the county. The NWTF initiated the State Wildlife Law Enforcement Officer of the Year award in 2000 to highlight the contributions from wildlife officers across the country. This award recognizes that without the support for wild turkey conservation from wildlife officers, restoration efforts and wildlife management strategies would not have the success they do today. By earning the State Wildlife Officer of the Year award, Wildlife Officer Rucker and other state winners are eligible for the NWTF’s National Law Enforcement Officer of the Year award, which will be presented at the NWTF’s national convention. Officer Rucker has been a wildlife officer with the ODNR Division of Wildlife for 13 years. He was previously assigned to Fayette County, and before becoming an officer he was a Natural Resources Worker at the District 3 Office in Akron, Ohio. ODNR ensures a balance between the wise use and protection of our natural resources for the benefit of all. Visit the ODNR website at ohiodnr.gov.